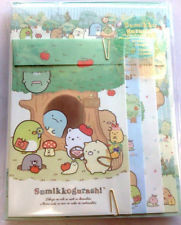 It's the kawaii letter set swaps you know and love..
You will write a short letter to your 3 partners on kawaii stationery. Must be NAME BRAND. No dollar store/generic kawaii. what kawaii character is your spirit animal? do you have any money-making hobbies? if you had unlimited money to spend on craft or swap supplies, what kind of stuff would you buy? do you like Peeps candy? what is your favorite Easter-themed candy or treat? You should have a 4.95+ rating and no unresolved 1s or 3s to join!